CDC Has Tips For 'Zombie Apocalypse' And Other Disasters : Shots - Health News The Centers for Disease Control and Prevention has seized on the idea of a zombie apocalypse as a way to get Americans to prepare for more likely natural disasters, ranging from floods to earthquakes. 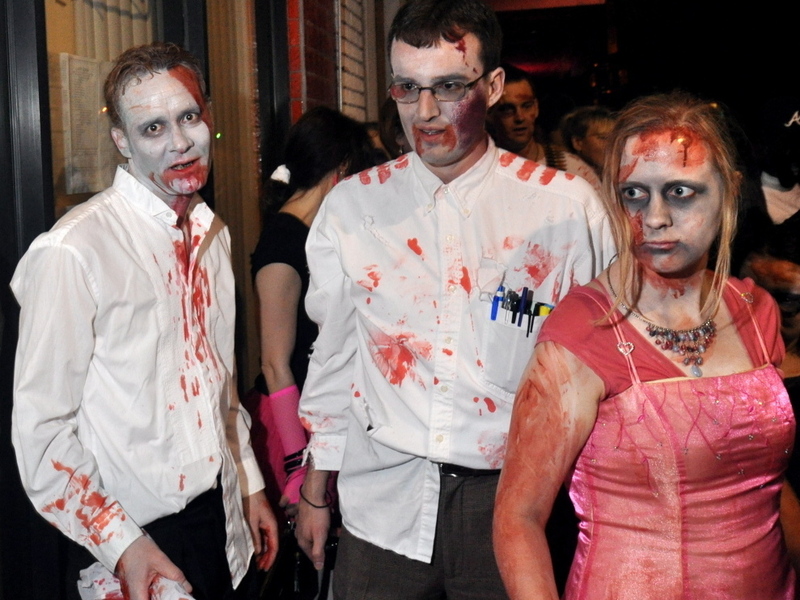 An unnamed trio terrorizes downtown Silver Spring, Md., during the 2009 edition of an annual zombie march. Here's a simple public health message: If you've prepared for a zombie apocalypse, then you're ready for just about anything. The Centers for Disease Control and Prevention seized on the idea as a way to get Americans to prepare for more likely natural disasters, ranging from floods to earthquakes. Whether zombies are on the march or tornadoes are on the horizon, you'd do well to have emergency supplies of drinking water, nonperishable food and medicines. the CDC says. And you and your family should have contingency plans that include sheltering in place, evacuation and predetermined spots for meeting up in case you get separated. I have one suggestion for the CDC: You might beef up your server capacity to prepare for a real zombie invasion. 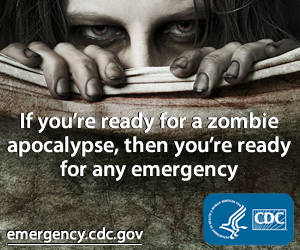 The zombie meme proved so popular when CDC posted the idea on an agency blog yesterday that the traffic crashed it. Separately, CDC is out today with a Top 10 list of public health accomplishments for the first decade of our still relatively new century. Leading the list are advances in vaccines (protection against rotavirus and pneumococcal infections), prevention and control of infectious diseases, and reductions in smoking. Let's see if prevention of a zombie apocalypse makes the greatest hits list 10 years from now. For more on CDC's zombie preparations, listen to Thursday's All Things Considered.